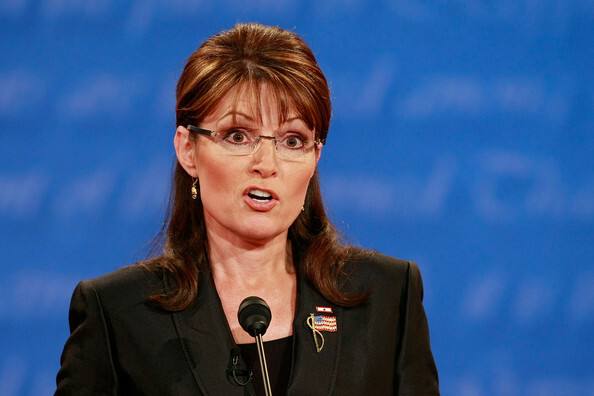 The Warped Lens of Perception: Atheism, ***Insert religious text here*** Nerds and the US of Stupid. 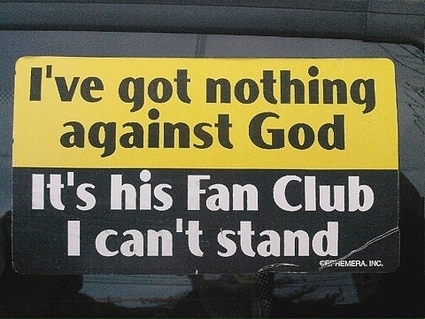 Atheism, ***Insert religious text here*** Nerds and the US of Stupid. That's right! I went there! Okay... I am gonna say it... I am tired of religion. ALL RELIGIONS. I am tired of the Bible Nerds Bashing the Torah Nerds bashing the Quran Nerds... 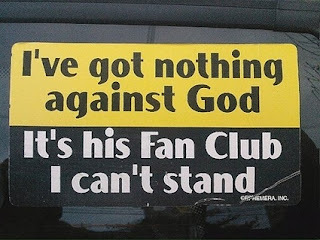 I am tired of all of them ganging up on the Atheists and I am tired of the Atheists insistence that they hold no religion. The whole thing is just absurd. The current events governing religion and medical insurance are infuriating. To make things worse, in a forum I participate in, an Atheist has suggested jailing or even killing all the religious people, in much the same way as Albania did from 1967 to 1990. The USA is founded on this little thing called the constitution. Part of which are the amendments. The first ten of which are called "The bill of rights." The first one states "Congress shall make no law respecting an establishment of religion, or prohibiting the free exercise thereof; or abridging the freedom of speech, or of the press; or the right of the people peaceably to assemble, and to petition the Government for a redress of grievances." the northern part of the US of Stupid! Fortunately, we are, and all believers are free from laws persecuting their particular beliefs. Ninian Smart wrote a book on religion and it is pretty much considered the definitive work on the subject. The book lists 7 criteria to be a religion. The Seven Dimensions of Religion actually place atheism squarely as a religion. 1) Narrative. Religions have stories that explain the nature of the universe and our part in it. Evolution is a story about how we came about from the cosmos. 2) Experience. According to Smart, there are two aspects to this. First is the events that happened before the religion was founded. Charles Darwin's observations and the book (by his grandfather Erasmus) Zoonomia. Faith is included in this "dimension". Most atheists put faith in science. The World English dictionary defines faith as "any set of firmly held principles or beliefs." By that definition, the most faithful people I have met are atheists. In my book - this is a religious experience! 3) Social. Social This covers the structures present within. In atheism, this starts with the researcher, who posits a theory, then proves it experimentally, passes it on to his colleagues who confirm it, then it is passed on to the instructors, schools, text books and television. A lot like modern Christianity. Like many religious orders, scientists hold conferences and come together to share their knowledge and faith and decide what should be believed... I still, for the record, believe Pluto is a planet. 4) Doctrine. Muslims have the Quran. Christians have the bible. Atheists have Unified field theory, string theory and evolution. 5) Ethics. The bible, Quran, torah and other religious books are full of them. Scientific method, MLA citation and accreditation are those of the atheist. By not following these rules a religious person can and will be ostracized. The same is true for scientists and atheists... politically correct speech, proper lab procedures, giving proper credit in your work... fail to do these things and you are ridiculed and can lose your job, your friends and be forever discredited. 6) Ritual. On the surface, it seems atheism is lacking in ritual. Primarily because of it being a newer movement with a lack of history. Many Atheists do perform rituals however. Birthdays, and anniversaries, personal little rituals shared between lovers, valentines day, the public celebration of Darwin's birthday in February, paying taxes, watching their "Shows." In Autistics and Aspies, these rituals are even more prevalent in many cases. 7) Material. Buildings, texts, art, and the like. The things that people who wish to learn and advance in the religion will see, experience and visit. The Smithsonian, the Natural History Museum in New York, Origin of the Species, A Brief History of Time, artists renditions of extinct species... Atheism has them. So... according to the argument, all religious people should be jailed, killed or expelled... Ok... That means... everyone... I guess I'll see you next time... after I move to the UK, Australia or the Moon. 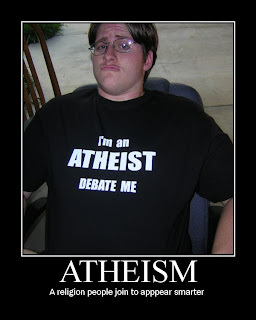 The picture of the man in the "I'm an Atheist" shirt is a contradiction, "Atheism. 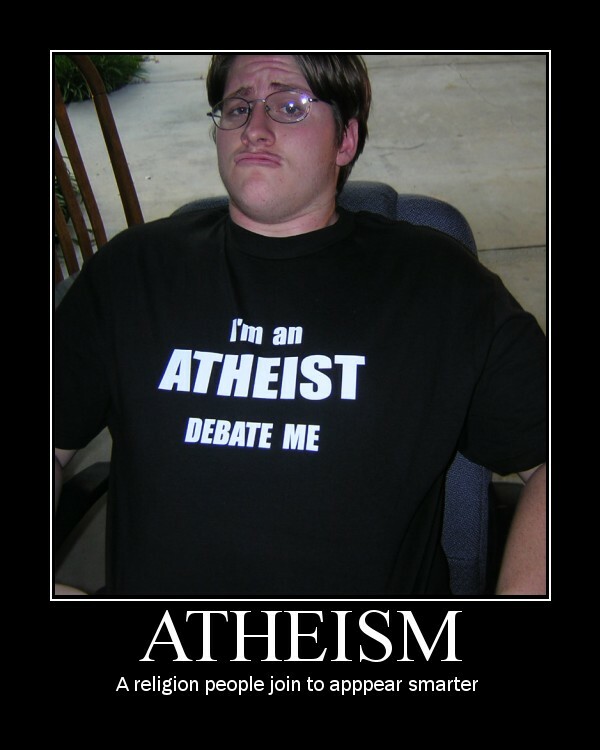 A religion people join to appear smarter", Atheism is a belief that there is no gods, goddesses, or supernatural beings, they are all created by man to help explain the mysteries of the universe. In this since this means Atheism does not support any religions, there for it would NOT be categorized as a religion, or ever will be. Due to this fact the picture would be considered an oxymoron and a prefect example of irony. Thank you for looking at the photos on my blog. If THAT is all you are doing, then I urge you to actually READ the article. 1) as my article explains - the supernatural is NOT needed for religion. 2) You have mistaken ORGANIZED religion for religion... That is a common mistake. But... since you only look at the pictures... I would like to point out... that is kind of why I put that one up there.